The South East 2008 show in Guildford has been and gone - and if you couldn't make it, here's a round up of news from the event. RISCOS Ltd were showing off an internal development build of RISC OS 6 with a few new features including support for 64,000-colour screen modes that use the same amount of Video RAM as 32,000-colour modes; a new colour picker that uses the CIELAB model, as used in PostScript 2 and 3; and better alpha transparency support in Paint. The prototype dual-widescreen A9homes were also on show. ROL's Paul Middleton said: "I only showed a demo of the next stages [of RISC OS 6] at the show as other demands on people's time has meant that getting a full release together hasn't been possible for the show. The main feature is that we have now got a 64K screen mode for all machines. This offers a number of advantages that will be detailed in a forthcoming announcement." RISC OS Open have published the latest batch of RISC OS 5 source code - which includes the driver module for the Nvidia graphics cards used in the Iyonix plus the operating system's networking and internet modules. They were also selling little desktop calenders for 2009 to raise funds for their shared-source project. Steve Revill was overheard saying his team would come to shows to raise the cash to go to the following shows. ROOL also had a large annotated graphic representing a RISC OS 5 ROM image and had labeled all the components they had published. The team are not far from being able to offer a full ROM image which they plan to bundle with an open source machine emulator so anyone, especially non-RISC OS types, can download and try - such as a RiscPC build with RPCEmu.There was, shall we say, a "lively discussion" between Qercus editor John Cartmell and the ROOL gang on their stand about how this scheme might impact the market. MW Software also showed off TechWriter and EasiWriter 8.8 with a new window that displays the structure of documents. The update is set to go on sale to everyone soon. Martin Wuerthner, of MW Software, said: "A long-standing feature request has finally been implemented - a structure view window that shows a hierarchical view of your document's structure alongside your main document window. "In the structure view you can expand and collapse (fold) nodes to show or hide detail and clicking on any item takes you to the corresponding structure in the main document, which makes navigating complex documents very quick and easy." A new port of Gutenprint for RISC OS is also set to be released in the near future. Martin and John Tytgat are also continuing work on a new PostScript driver, and Martin highlighted some of the issues with the current Acorn driver - such as it creating documents with layers for every colour in a bitmap. Photodesk 3.09 was unveiled by CJE Micros. It features a redesigned user interface, a zoom gadget, new brushes, palettes and stamps, and more. A rewritten manual is also being worked on and third-party programmers are set to be invited to develop plug-ins for the graphics package to add extra features. A demo version of the new release is also available for download. Version 2 of file and printer networking software LanMan98 was ready in time for the show. It now supports encrypted passwords, can handle hidden files better, is more friendly towards Windows Vista and network-attached storage devices plus other small tweaks. NAS devices, essentially large hard discs in a box connected to a network, are becoming increasingly popular and the new release of LanMan98 is expected to cope better with these pieces of kit. R-Comp have been busy: backup tool SafeStore is now available following its preview at Wakefield 2008. It can backup folders automatically at set times in the background or can be triggered manually. Internet connection manager NetFetch can now send emails without the need of a separate email client and other programs can send emails using NF 3.50. There are also other tweaks and enhancements, we're told. 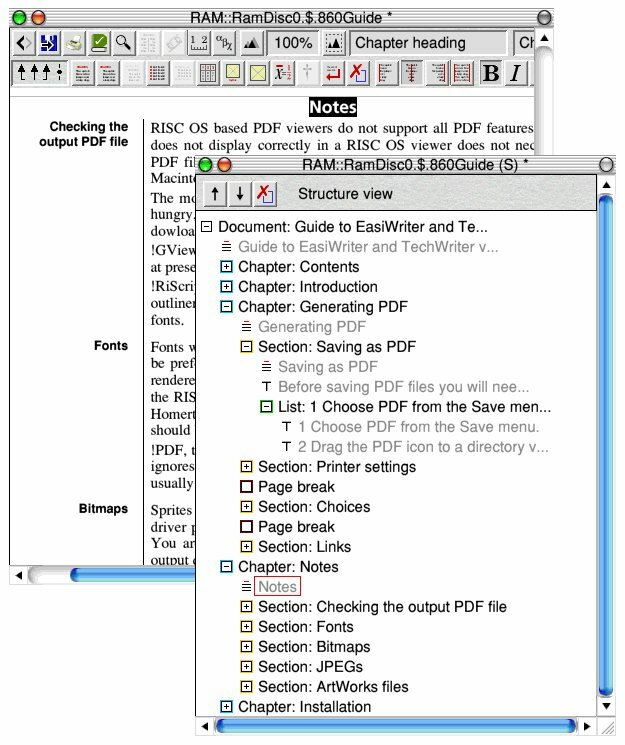 UniPrint 3.50, which allows RISC OS users to print documents via Windows PCs. now supports Windows Vista. The Windows, Linux and Mac OS X port of MessengerPro has been rebranded from its old name, Gemini, to simply MessengerPro, and will be sold by R-Comp. Meanwhile, Steve Fryatt had new versions of his PrintPDF and CashBook software, and Paul Vigay was showing off his animated GIF package. Graham Shaw and Netsurf had their usual show presence as well as the ARM Club and ADPL. Qercus and RISC OS Now both had new editions, and John Cartmell told readers of his magazine at the show that his publication had been put on ice while he comforted his dying father. John is now back to work. There were fewer stands this year - and no VirtualAcorn, Fortran Friends or Castle. Mark Stephens, who went along to the show, said: "There seemed to be a range of reactions among punters regarding the recent news from Castle - I don't think it was a big surprise to most people and some welcomed it as an opportunity to 'clear the air'. I think, unfortunately, there are still lots of people with polarised views and are either in the Castle or the RISCOS Ltd camp. "RISC OS Open's plan to offer a RISC OS 5 ROM as a free download with an emulator for people sounded like an exciting attempt to get people back onto the platform. Some punters expressed concerns about how this might affect VirtualAcorn while others felt some competition might be a good thing. I think some people were surprised as they saw the end of the Iyonix range as the end of RISC OS 5. "There were fewer people than last year, but exhibitors with new things to sell seemed to be doing a good trade." Send Drobe news or write for us Article contributed to by James Shaw and Mark Stephens, who bumped into a punter who travelled all the way from Paris to attend the event. How nice to see Drobe in full action again, thanks for an excellent report of the SE Show fot those that were unable to go.in person. Thank you, very informative show update. The Photodesk news is great! This article makes my day... since for one Drobe seems to be in action again and then certainly as important all the good news about progress and new versions. LanMan98 ist very nice indeed - I already have it and put it through some tests: 1. Works like a treat with Windows Vista (as was to be expected), and certainly with Windows XP. 2. Is significantly faster than LanManFS in RISC OS 5. A file of some 600MB was transferred from XP to RISC OS 5 RAM Disc with LanMan98 in about 60% of the time that LanManFS needed. To fetch a directory with some 30MB and over 700 files onto the RAM Disc was about six times as fast with LanMan98 opposed to LanManFS. Nice to see Drobe back on form with this informative article. Was not able to make the show myself, but thanks to this article I now know the gist of it. Looking forward to attend the MUG show in December. Good news for Easi/Techwriter - I've been waiting for that feature for ages. It's a shame I couldn't make it to the show, so it's good to have Drobe keeping me informed. "The team are not far from being able to offer a full ROM image which they plan to bundle with an open source machine emulator"
This is the news I have been hoping for for several years. I do wonder if it's too late now though. If I still has a RPC, I'd be looking forward to the forthcoming select release allowing 64,000 colours. One wonders why this wasn't something they looked at earlier into the scheme. Certainly will be a welcome addition to Risc PC users. I wonder if this would also effect A7000/+ systems. Looking forward to buying the LanMan98 upgrade and MUG show in December. BTW, is anyone else finding Drobe slow to access at the moment? Ditto - very slow for me too. "Meanwhile, Steve Fryatt had new versions of his PrintPDF and CashBook software..."
I'd just like to pass on my thanks (again) to those who bought discs or CashBook manuals off me at the show, as well as those who gave straight donations on finding that I'd sold out. I was able to give a donation of £130 to St Catherine's Hospice this morning -- far more than I had been expecting. Please excuse the "me too", but I must say it really is a pleasure to have drobe back again. Despite all the gloom there were plenty of "green shoots"at the SE show. The updated EasyWriter is important for keeping up with MS Word and the Photodesk development is welcome. There was a good showing of MUG members- getting tips for our Christmas show and attempting to recruit exhibitors. Fortunately, they all agreed to come or at least said they would try. I'd like to add my gratitude for the return of Drobe. Despite the several excellent RO websites (e.g. RISCOS.org, Paul Vigay's site to name but two) and the newsgroups, I think it is important for the platform to have a news reporting and forum site and TIB just doesn't fulfil that function ATM, for me at least. I find the continued development activity on a number of software and OS fronts encouraging, particularly the proposal from ROOL to distribute a free RO5 + emulator bundle; hopefully this will stimulate outside interest, as well as giving Iyonix owners like me an upgrade path to new non-native hardware in the future. I absolutely second your gratitude for drobe being back! As for news etc. drobe simply was the best! And a RO5 emulator pack from ROOL would be really nice! What's an open source machine emulator? What's the difference between that and VirtualAcorn/VRPC etc? What hardware possibilities does this open up if any? What has been suggested by ROOL is to use a different emulator that is a bit more platform independant (i.e. runs with *NIX) & supply a RISC OS 5 ROM free which may work with it. I am guessing that the intention is to use rpcemu (or some derivative) to allow the use of linux or something. In terms of hardware that will depend on how good the emulator is. The OpenSource emulator will offer a free solution but will probably not be as 'polished' as VRPC. If that could open the way to RISC OS accessing the hardware directly then it sounds interesting. During Steve Revill's ROOL talk, he mentioned that a RPC HAL is available for use with a RISC OS 5 ROM image. He also pointed out that people will be able to study both the Iyonix and RPC HALs, to help in creating a HAL for other ARM based hardware. At the moment both VRPC and RPCEmu emulate the specific legacy hardware of the Risc PC. If you have an open source emulator and an open source target OS with a well defined hardware abstraction layer i.e. RISC OS 5, you can abandon having to exactly replicate vagaries and limitations of this old hardware, and instead do what Virtual Machines such as VMWare do, and implement RISC OS drivers for an idealised set of generic hardware. This greatly simplifies the emulation, and increases its performance, as there is then a close mapping between the RISC OS driver and the higher level APIs of the host system. You also open the door to make far more use of the host systems facilities than current emulators, such as offering access to the host's USB and Bluetooth perhiperals using high level calls rather than having to implement the hole USB and Bluethooth stacks in software on the RISC OS side. Also you can make use of software components such as audio and video codecs, which aren't available for RISC OS, and would run too slowly in ARM code in any case. There is an incredible amount of potential for an open source emulator running ROOLs code, which goes way byond what is offered by VRPC, over an above the current sticking points of not running on Linux and not allowing you to have a USB memory stick based portable RISC OS emulator image. Thanks to druck for a concise and informative summary of the emulation issues. It has become fashionable to decry the shortcomings of RISC OS compared to modern platforms, and I'm not saying the criticisms are misplaced; but we shouldn't overlook the fact that RISC OS has merits that have ensured its continuing use by, and the loyalty of, far more people than an obscure 20-year old OS has any right to expect, including many of the correspondents here. If a way can be found to combine these merits with the advantages of a modern system, a truly exciting and interesting future for the platform could be assured: I certainly hope so. What concerns me about abstraction layers is that isn't RISC OS still sitting above it becoming ever more archaic? Or are changes being made to the OS that will take it forward as the hardware around it advances? Driving the hardware is one thing, the underlying architecture of the OS being a single threaded anachronism, is quite another. Unfortunately if you do any significant redesign to address this, you break the majority of the applications, which wont ever be updated to take advantage. So we are going to stuck with that just as much in the future as we have been in the last 20 years. Well a LInux ROOL-OS 5 would get me back to using it and even contributing (eg I contribute to SKYOS) to the platform in software and money. As for VARPC. I found their licence per machine (and not per user) to be too expensive so bought none of them. They could of course be 150ukp richer if I could buy one and use one anywhere. But that is their loss. And now with this announcement in the market of a ROOL EM... I'd rather wait and give them the money... if they need some. Druck I thought you said that VRPC froze the platfoirm and didn't justify investing in the OS whereas a virtual machine would? I did. But there is only so much you can change about the fundamental architecture of the OS before the applications stop running on it. We aren't in a situation like Apple where they can make huge changes, such as switch processors, and the software developers will quickly port over a critical mass of applications. We aren't even in the situation of 6 years ago with 32 biting software, as that's a relatively simple process that doesn't even need source code in most cases. Significant changes to the majority of applications required to cope with, never mind take of advantage of, a radically modernised OS, can't be expected now. So RISC OS will still have to exist with in the limitations of its core architecture, but that doesn't mean a lot of things can't be enhanced, and you can't take emulation way beyond the speecy emmy toys we have today, in to something that resembles professional VMs, with peripheral utilisation, hardware acceleration, deployable images, checkpointing & rollback, etc. summer is over and Drobe is back again - thanx, thanx, thanx a lot to the drobe team for new articles and the excellent show review!! instead of going about it top-down and presuming the applications must be changed how can people change the OS to account for non-multithreading applications? Surely the bigger point is however, the OS simply *has* to change and advance and if there are applications right now that are important like Photodesk and Easiwriter that people depend upon and the authors know this then they have the incentive to change them. If they're not used these applications (like games now for example) will just have to slip below the radar until some system of emulation is devised (which with ever faster processors shouldn't be that hard). If people,are that desperate for an application which can't be updated to multi-threading or whatever in the short-term then there are still a variety of other options: A9, 2nd hand Iyonix, VRPC. AW: "instead of going about it top-down and presuming the applications must be changed how can people change the OS to account for non-multithreading applications?" The approach I've taken with ROLF is to start with the equivalent of the RO polling system, but extended it to allow new applications to make use of the underlying preemptive scheduling and asynchronous I/O from Linux. Specifically, there's still Poll and PollIdle (called PollWait), which block the calling thread until the Wimp sends it an event, but there are also two more functions, Detatch and PollActive, which allow the calling thread to keep working while waiting for events from the Wimp. The former detatches the process from the Wimp so it can do anything non-screen related in the background and be informed of pending Wimp events by a signal (or selected file descriptor), the latter allows the process to continue working while waiting for the Wimp to authorise screen-related activity by the process. Also, screen redraws are requested of processes in parallel (one outstanding rectangle redraw per process). Since the kernel is Linux, processes can also start threads, but the above allows a lot of flexibility without needing the complexity inherent in threads. Erk! Information overload! Is this ROLF to run RISC OS apps on Linux? No, it's meant to provide a RO Look and Feel on a Linux kernel, but with the possibility of providing sufficiently RO-like behaviour that RO applications could potentially be run (via an ARM emulator or the Brandy BASIC interpreter) as processes under ROLF. At the same time, it should provide features not available in RO, such as pre-emptive multi-tasking, memory protection, shared libraries, support for a wide range of hardware and peripherals etc. that come pretty much for free with Linux. That's the idea, anyway. Its progress is erratic, to say the least. I've still got my fingers crossed for ROLF, despite it's "erratic" progress. The cold hard fact of my work is that I need to use OpenOffice on a laptop. Try doing that using RISC OS. I'd love to stick with pure RISC OS...despite the ridicule of techies who mock it's under-hood gubbins...and the ridicule of plebs who freak out if the backdrop on their Windows machines gets changed when they're not looking. To be perfectly frank RISC OS is the only GUI I have ever liked, and the only one that I've gone through an entire session without cursing. ROX doesn't cut it either. It does however run on top of pretty much any Linux/BSD/Solaris/$OTHERUNIX and runs all the other apps. back in the day there was away of win running in the desktop is it possible to do it the other way in VARPC??? I remember using a program that seemed to nab window contents from Win98 (running on the PC card) and stick it in a RISC OS window on the desktop. Result was that to the end user you were using Word/Excel on RISC OS. It was clunky and slow (mostly due to the speed of the PC Card I think) and I preferred all the ROS apps anyway - but when I had to do a course at Uni that specifically required Excel - it did the trick. Now a similar thing that could grab contents from the host OS (say Linux) and move it into a ROS window on VRPC (or ROOL's hopefully-not vaporware emu) - That would really hit the mark. This is most definitely not the first time this has been discussed here. From what I remember, I've never heard a technical objection. Concern has always been that if an app could be used under the host OS, then this would reduce funding for the ROS equivalents. Sadly we are in a different situation now. There is little to no funding for anything and in the current environment if you need to use a particular piece of software, you are going to use it - even if that means using a different OS entirely. To put it another way - lack of catering for the times when you /have/ to use a non-ROS app is what causes people to leave the ROS environment. If they don't use ROS for work, then ROS becomes something that you boot up once in a blue moon for nostalgia - ring any bells? On the other hand - if you could use that key app in a ROS desktop, you'd start using all your favorate apps - have !digitalCD pumping out your favorate music and use !Artworks to make your graphics... ROS could be your work environment again...and think of how much of an encouragement that would be to develop apps and utilities for ROS again. We're only here because we love RISC OS. We just want a way to use it all the time - even when you /have/ to use an app on a different system. This comment should be allowed to be posted. Page generated in 0.2829 seconds.